Our Rocket Needs A Recovery System! We've made enough craters, it's time to bring back our rocket on a parachute. In order to eject the parachute from the rocket some energy must be stored, and then released to push the parachute out when the rocket reaches apogee. Model rockets use a little chemical energy stored in gunpowder to pop the 'chute out. In keeping with our environmentally friendly rocket propulsion system we will use as little chemical energy as possible. Rubber bands will push a plunger to force the parachute out. The two pins on this release mechanism are retracted by rubber bands underneath. A length of mono filament fishing line holds the pins out until an Estes rocket ignitor melts through to release the parachute. 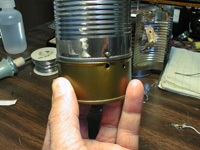 A can to contain the parachute mates with the release mechanism, and is held in place by the pins. A plunger inside the can, sprung with a rubber band, pushes down on the parachute. You can see the ignitor and fish line on the outside of the small can. 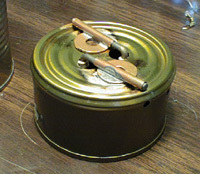 This animation shows how the cans separate after the ignitor fires and the pins retract.